Creativity. I find it all through the Oakland Museum of California, and as close as in my own backyard. 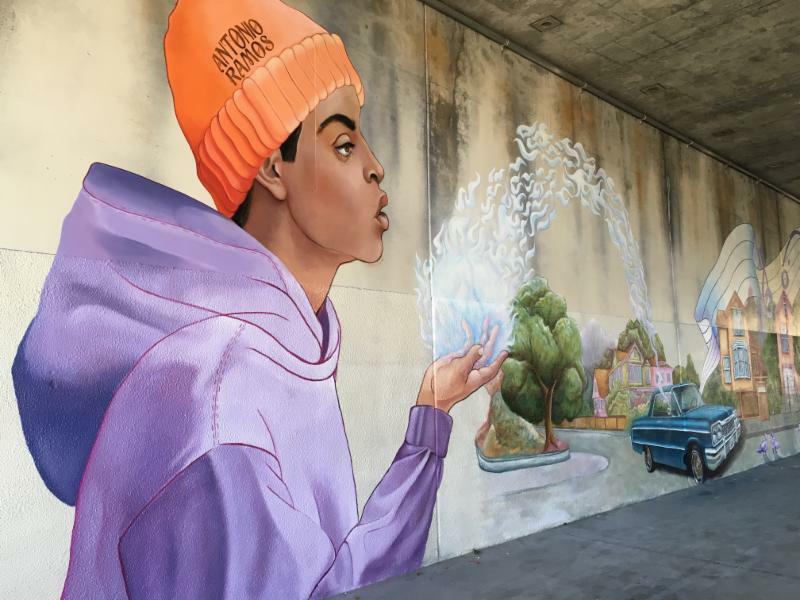 Last year I began to notice the murals all around Oakland, and saw them even more since muralist Antonio Ramos was shot while painting a community mural in Oakland. 2014 was a busy year for murals at the Museum, with the exhibit SuperAwesome: Art and Giant Robot. 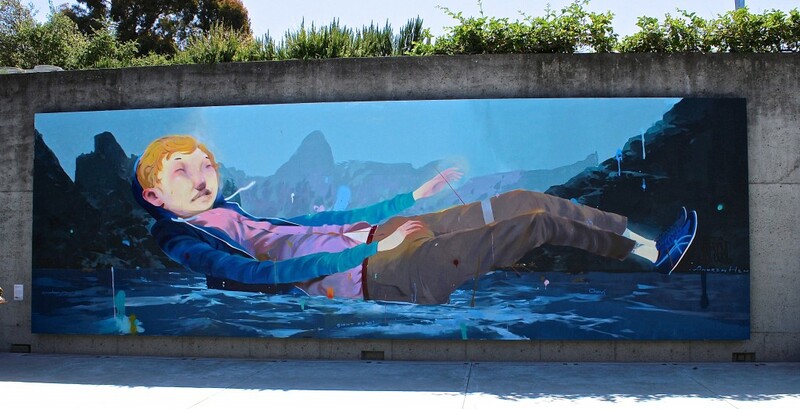 This mural was created by Andrew Hem using aerosol paints on our giant outdoor chalkboard in the Great Hall. Titled, “I think that possibly, maybe I’m falling for you,” it shows a slumbering youth in the mountains who perhaps is falling in love with the California landscape. I don’t see an “I am falling for you” expression. To me he looks like an adolescent boy not ready to commit himself one way or another. The SuperAwesome: Art and Giant Robot exhibit also inspired Kozyndan, a team of artists based in Los Angeles. 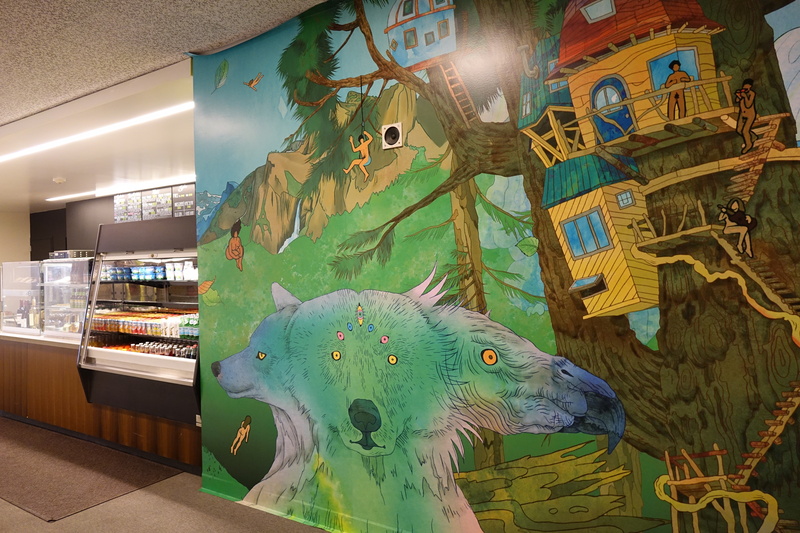 They visited OMCA’s Gallery of Natural Sciences, which reopened in May 2013, and were inspired to create this mural “Ode to California” in the spring and summer of 2014 for the exhibit. This summer, the Blue Oak Café at the Oakland Museum added another installation by Kozyndan. How lucky are we to have a new adventure on these walls! 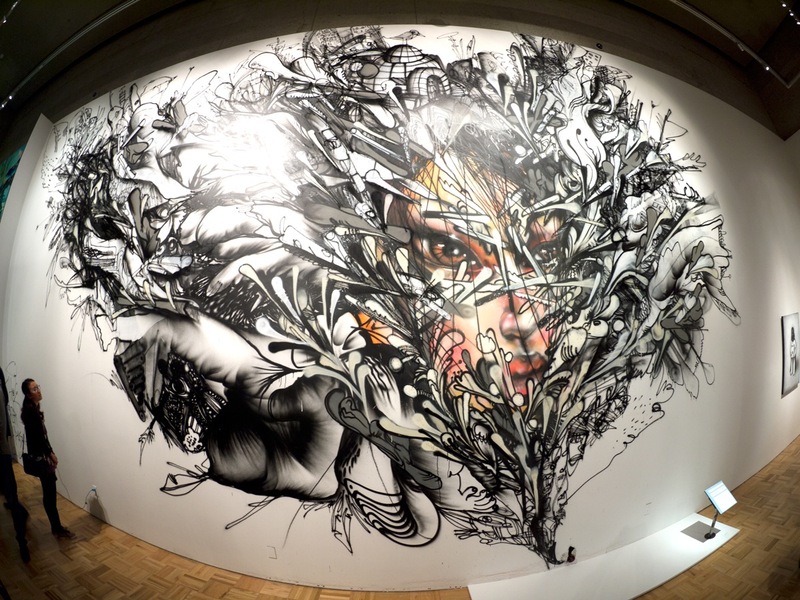 Finally, the most amazing mural, “Bird Flu,” was created directly on the walls of the gallery by David Choe, using spray paint almost exclusively. 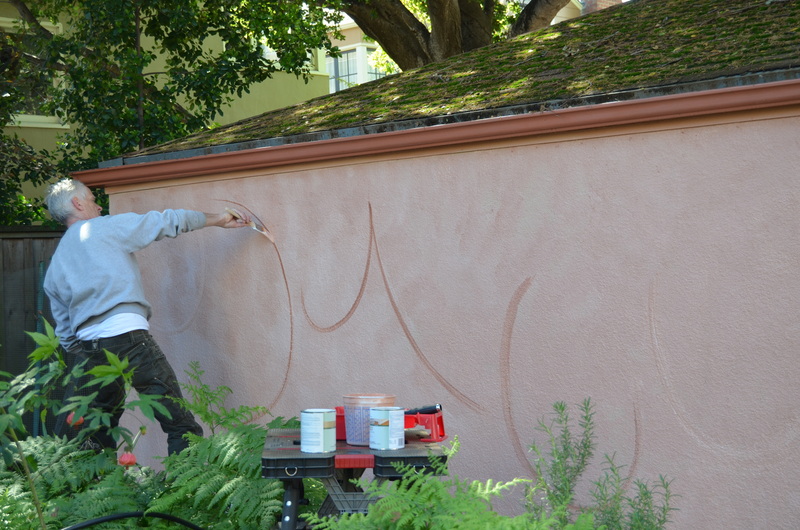 You can watch the mural being created in this You Tube video. Murals—where do they come from? Why do people paint them? When was the first one painted? The word mural is from the Latin murus which means “of a wall.” In French, the word mur means wall. 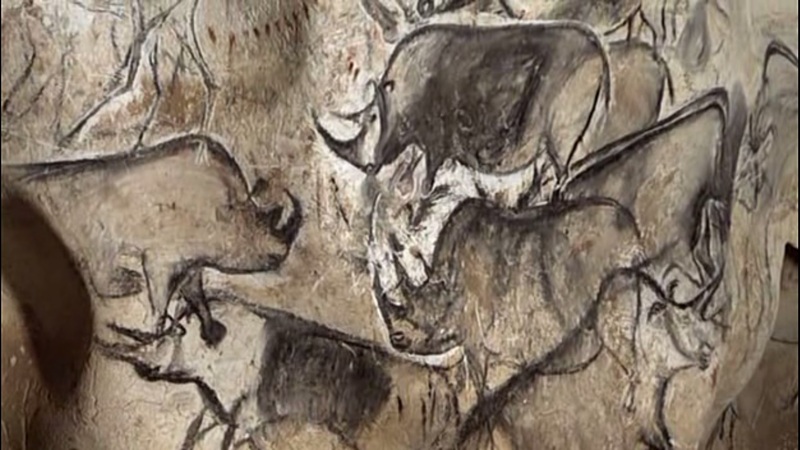 Cave paintings are believed to be the first murals, with the earliest of them found in southern France in the caves in Chauvet. Using the carbon-dating method, these murals were estimated to be 30,000 years B.C.E. The materials used for painting in prehistoric times were clay mixed with charcoal, spit, animal fat, urine, bone marrow, blood, vegetable juices, and egg whites. Later, pigments were derived from minerals, plants, and other natural sources. The artists even used the air brush method—blowing the paint through hollowed-out bones. Their brushes were made of ferns, horsehair, and twigs. Murals that tell stories about the communities in which they were painted can also be found on Mayan temples and church walls. 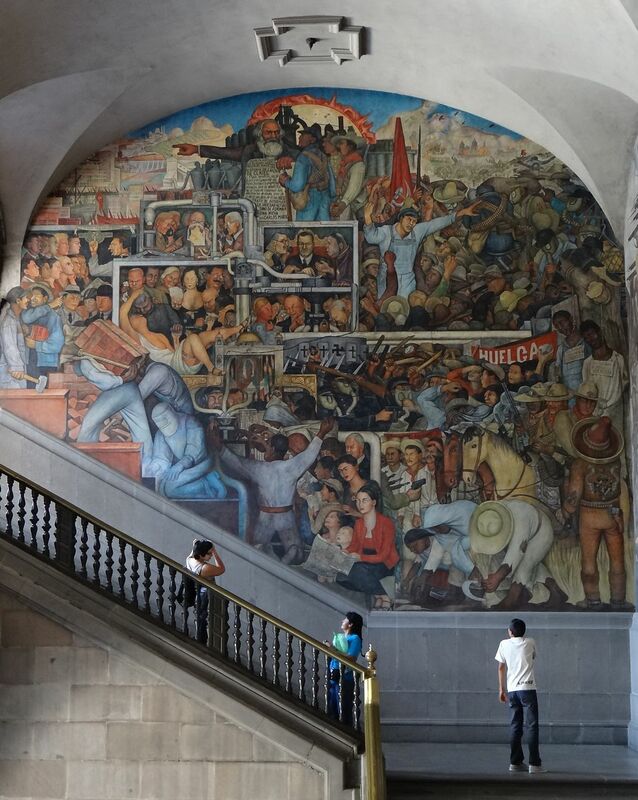 The artist Diego Rivera, best known for his murals in Mexico City, Chapingo, and Cuernavaca, and in San Francisco, Detroit, and New York City, continued this story-telling tradition with his mural about Mexico’s history, painted on the walls of the National Palace. It is one of my favorites. 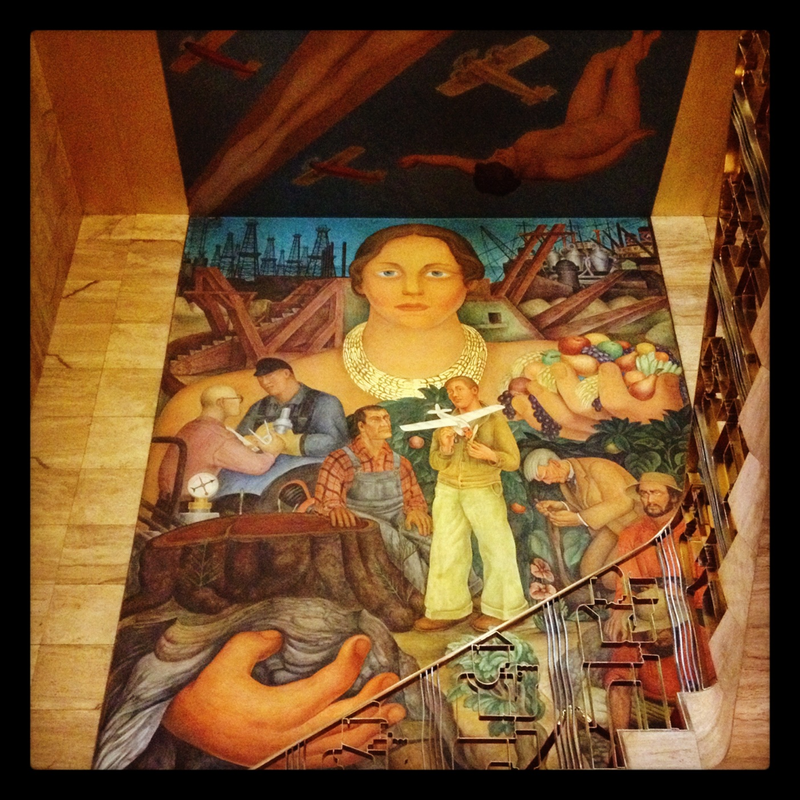 Locally, you can find one of Rivera’s murals, “The Allegory of California,” in the City Club in downtown San Francisco, covering a wall and ceiling between the tenth and eleventh floors. 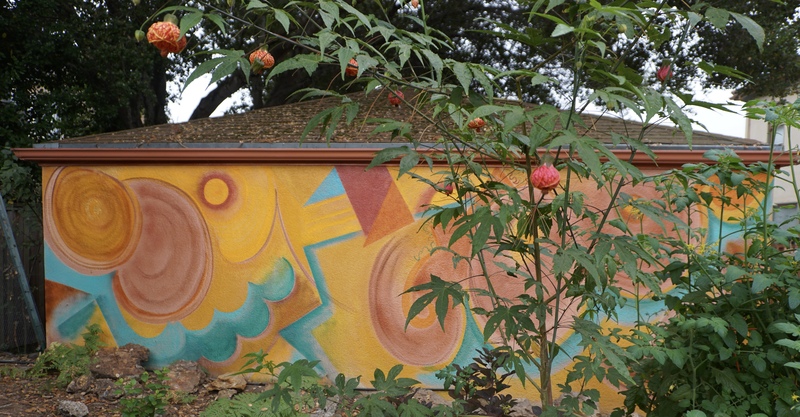 In 1930, Timothy L. Pflueger, a prominent and prolific architect of the Bay Area, invited Rivera to paint this mural. Completed in 1931, it is one of many political murals in San Francisco, depicting laborers and the goddess Califia, who represents California. Her right hand is exploring deep in the earth for all of its treasure, while her left hand shows the bounty that grows above ground. To create the goddess Califia, Diego had the famous tennis player Helen Wills Moody pose. There are three other Diego Rivera murals in San Francisco. His mural “The Making of a Fresco Showing the Building of a City” is located at the San Francisco Art Institute at 800 Chestnut Street between Leavenworth and Jones. 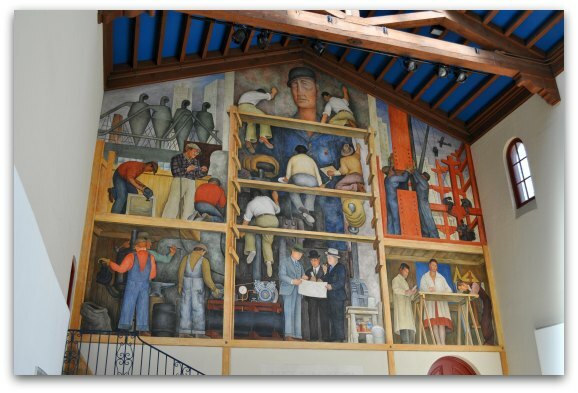 This mural is found at San Francisco City College in the Diego Rivera Theater located at Ocean Avenue and Phelan Avenue. 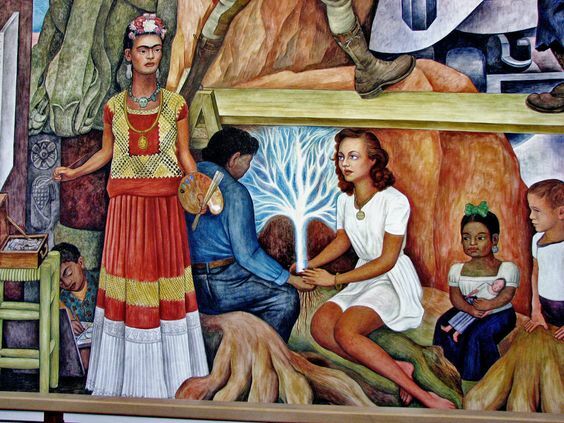 If you look carefully, in the center is a painting of Diego’s wife Freida Kahlo in a red dress with yellow trim. 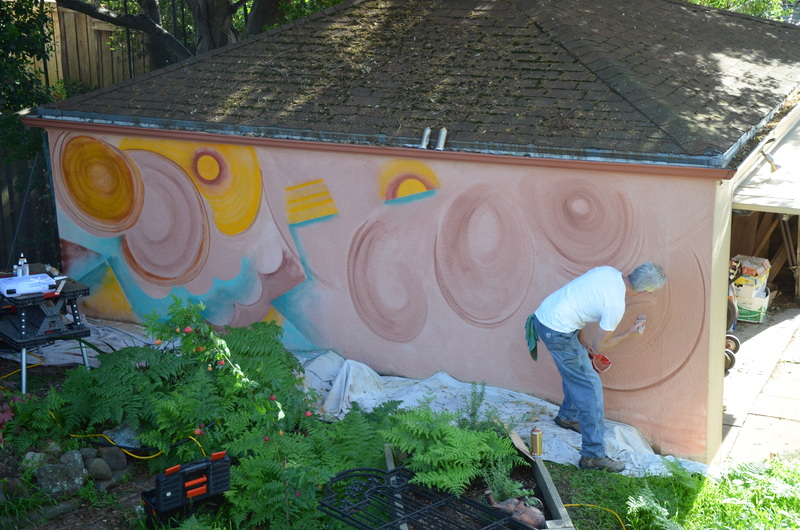 I was so inspired by all the mural activity at the museum that I wanted to create a mural in my own backyard. 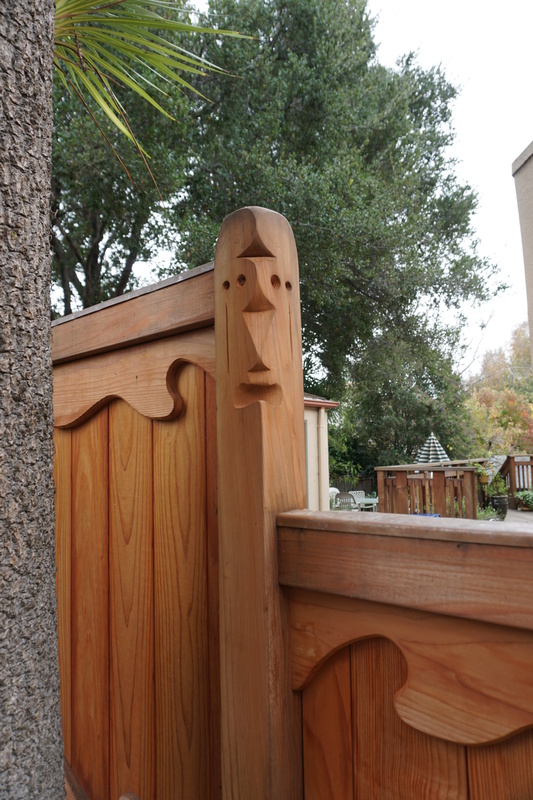 My yard is bordered by a fence on two sides and by my neighbor’s garage, which is painted a light shade of peach. The more I admired the murals of Oakland, the more I began to think about putting up some imagery on that wall. 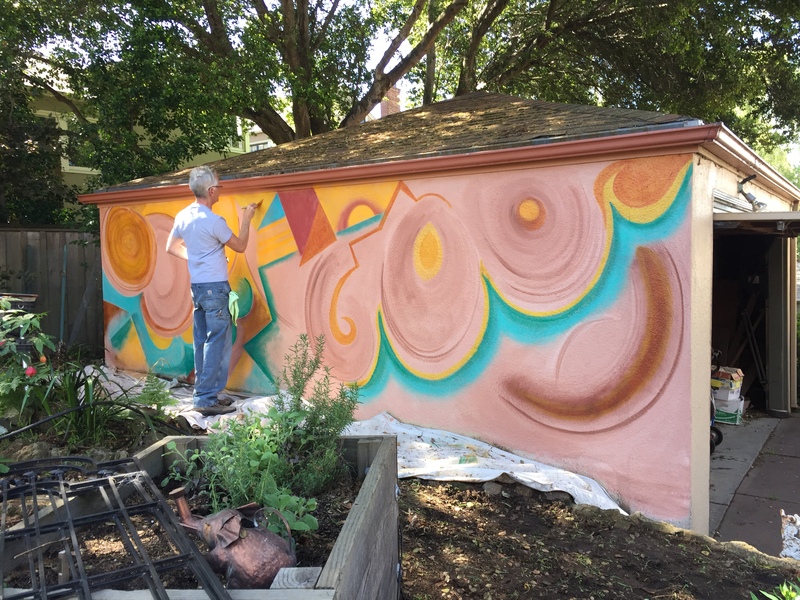 But a 21′ x 6′ expanse seemed too large to tackle—and besides I had no idea what I was going to paint on the wall, or if my neighbors would agree to me using their garage as my own private canvas. I have a dear, dear friend Toni, a dancer, my mosaic partner, and gardening inspiration. 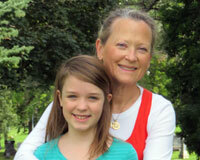 She is also the mother of those T-Sisters I have written about in earlier blogs. Her husband is Ramsey. As luck would have it, two years ago they moved a block-and-a-half away from me. I have watched Toni and Ramsey turn their new house—which had long been in need of some TLC—into a warm, colorful home, both inside and out. In the garage, which is Ramsey’s studio, color and design have found their ways to both the walls and floor. 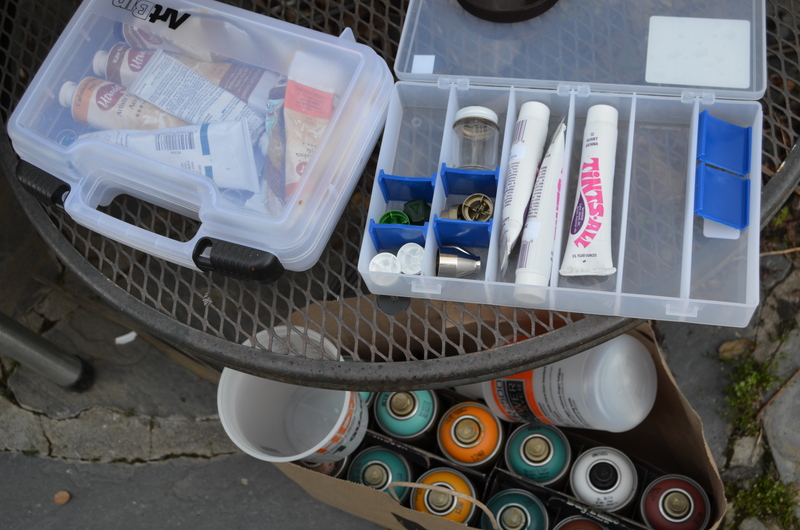 As I watched Ramsey’s garage fill up with swashes of color, I began to think about painting the inside of my garage, but didn’t know where to start. 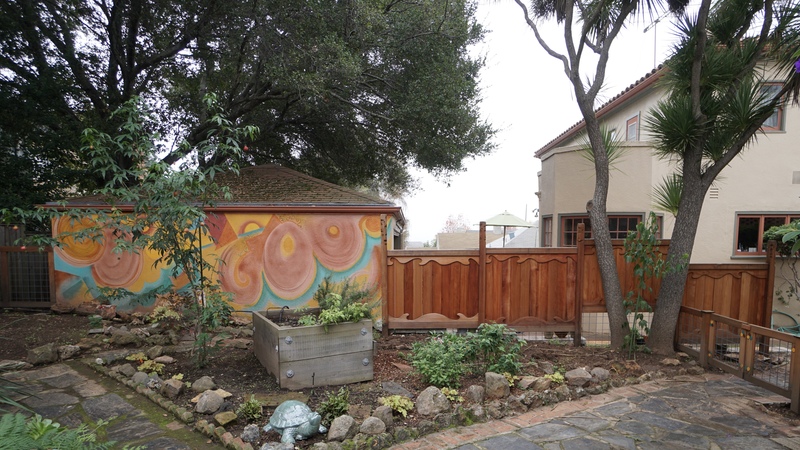 The backyard of their new home is Toni’s canvas, and she has turned an unruly overgrowth into a wild canvas of flowers, plants, vegetables, and trees that evoke the colors of Santa Fé. 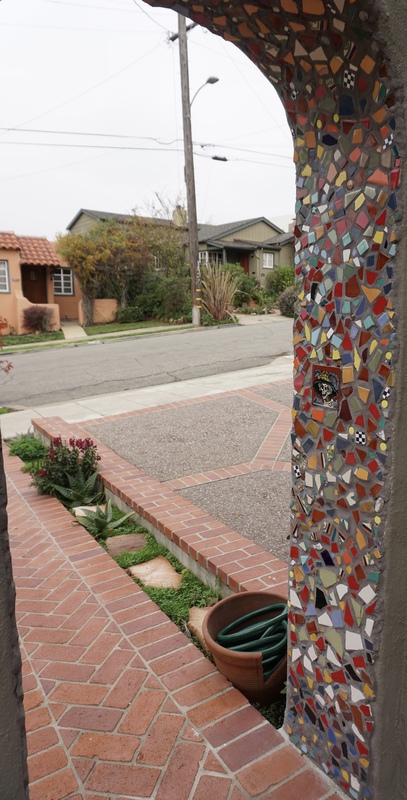 Over the last year, Toni and I have been learning the art of mosaic. 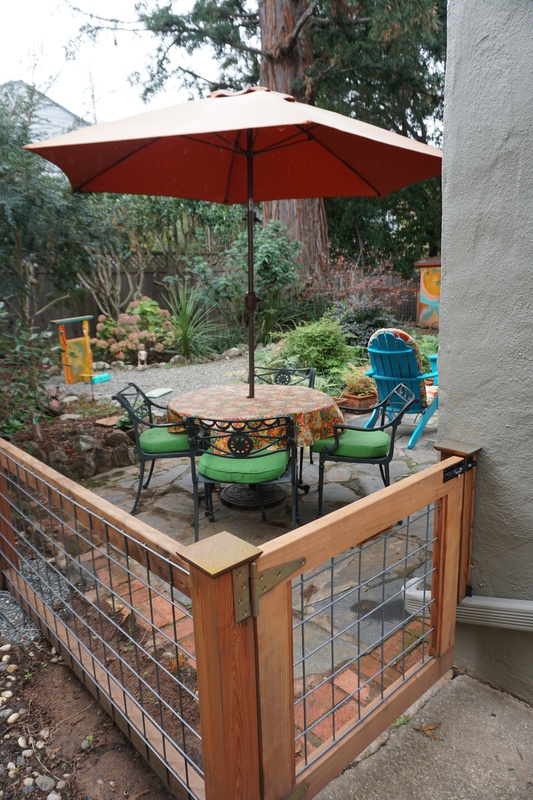 Her pieces have added more color and definition to their backyard, making it another room to live in. 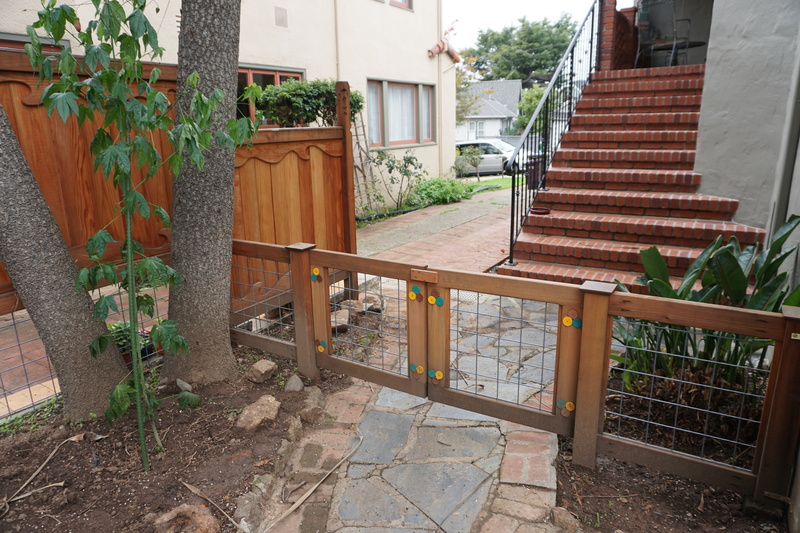 We tiled an archway at my house and made several stepping stone tiles for my backyard. The long and short of it is that I got permission from my musician neighbors, then turned Ramsey loose in the backyard. He painted it over several weeks with brushes and acrylic. 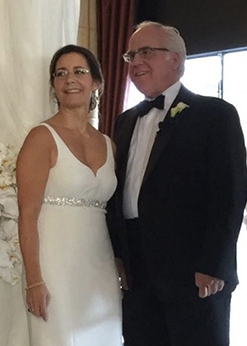 Ramsey, who recently retired from the tech world, has moved into a whole new world now! Ramsey doesn’t just come up with a design, the design comes from within him during the process. It was so much fun to see the changes every day and to look out my bedroom window to see how the morning sun brought the wall to life! It has transformed my garden. There were lots of visitors who stopped by as the wall’s design developed, and other neighbors continue to come by after hearing about the wall. Once the wall was finished, I had to put in some plants that picked up the colors. 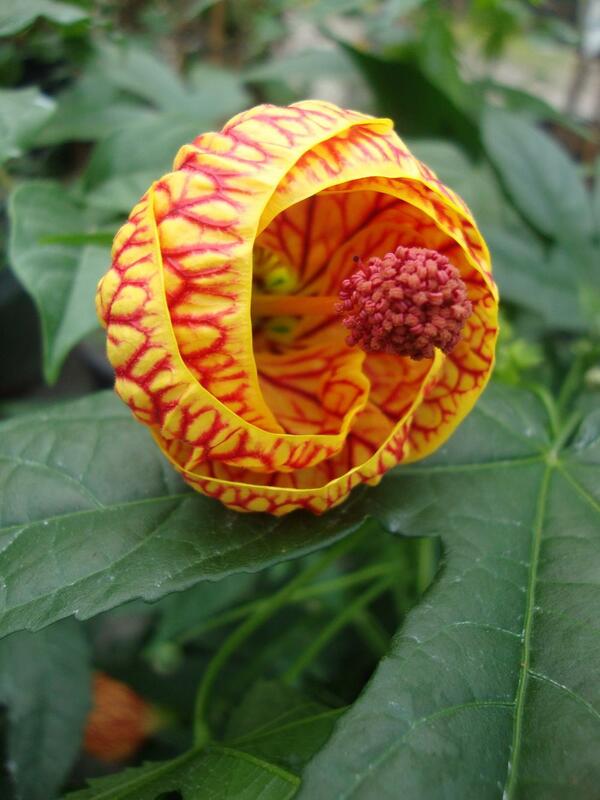 I chose abutilon for the orange-y colors. Also known as flowering maple, abutilon is available in white, pink, yellow, orange and red, and attracts hummingbirds and butterflies. A great choice for a lot of reasons. 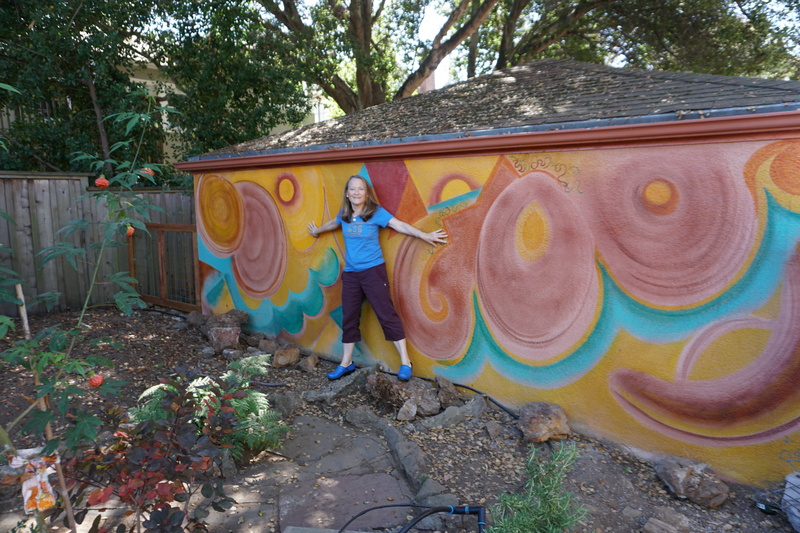 Here I am overjoyed with the finished mural! There were a few other missing pieces in my backyard. When I moved in there was a chain link fence covered with vines. I hated it, and after five years, I had it removed. The downside was that I no longer had any privacy. I have wonderful neighbors, but suddenly I felt totally exposed. Recently I decided to problem solve. 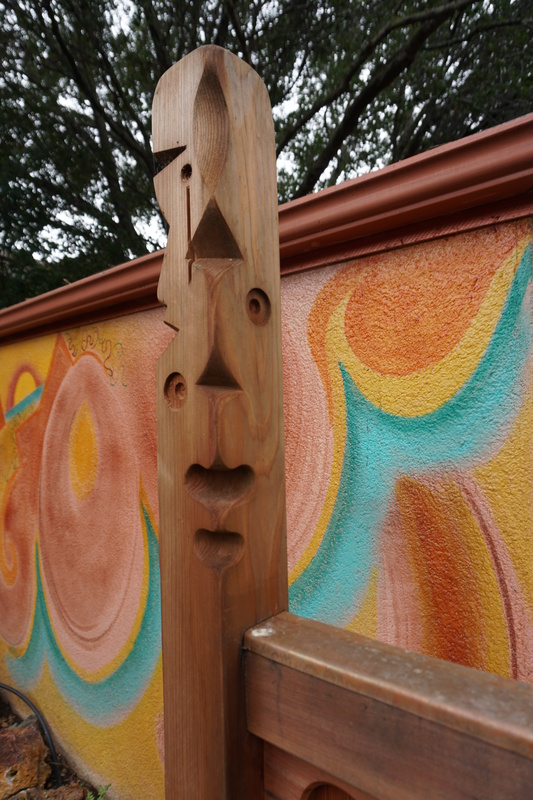 Solution: Ramsey built me a fence next to the mural! As with the mural, Ramsey needed to examine the landscape and the light. 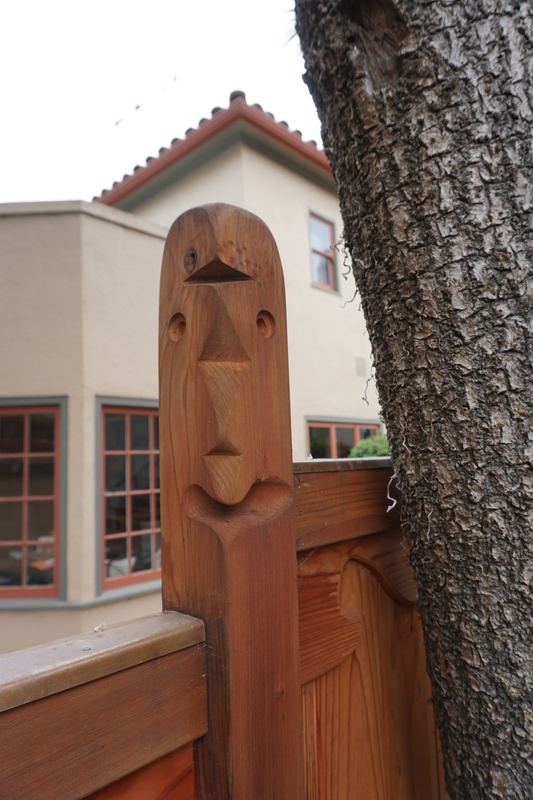 He then had to figure out how he was going to build around my yucca tree, and how and where he could embed the posts into the ground. With some research and a lot of thought, this is what developed. 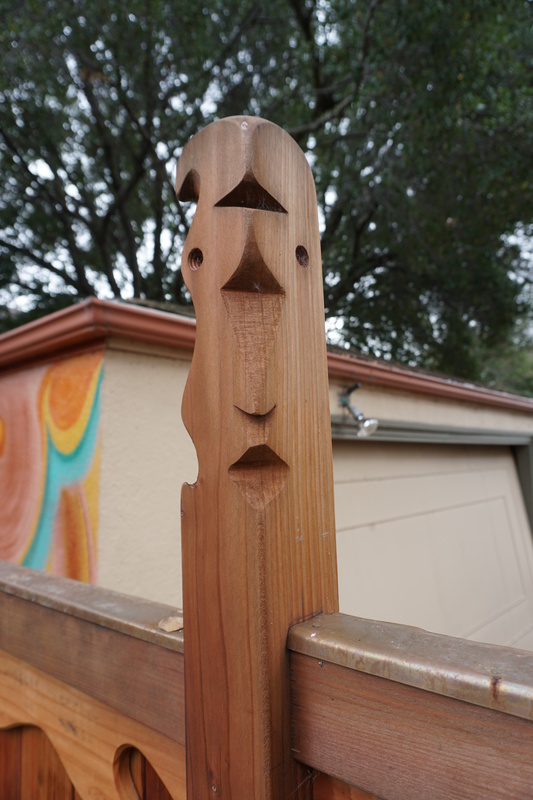 When you take a closer look, you will see copper flashing on the top of the fence and wonderfully hand-carved faces on the posts. 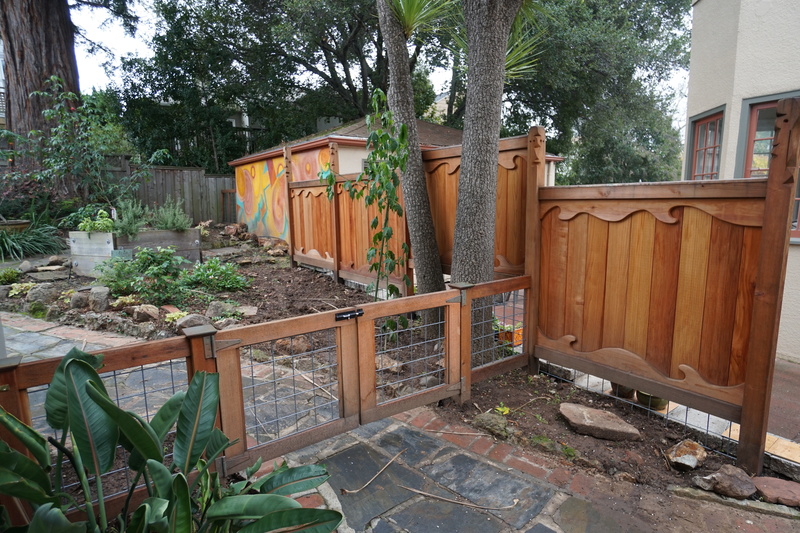 On either side of my house, Ramsey built a gateway to the backyard to add a finished look, and so that visiting dogs could be contained. 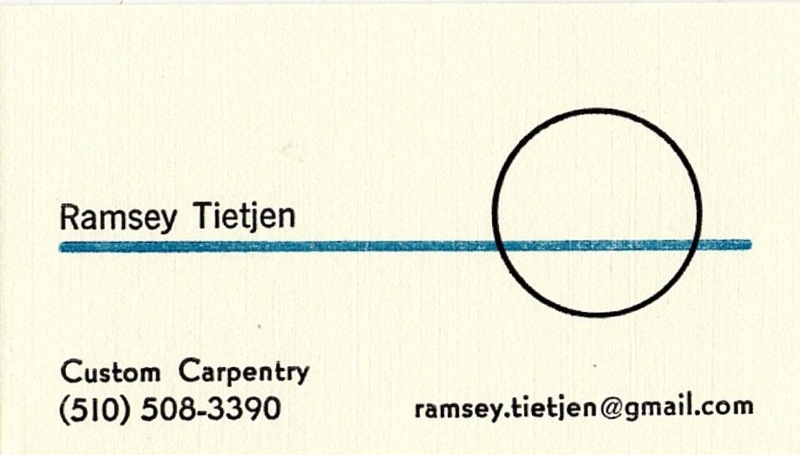 In case you are intrigued by what has been created in my backyard, here is Ramsey’s contact information. You will not be disappointed. 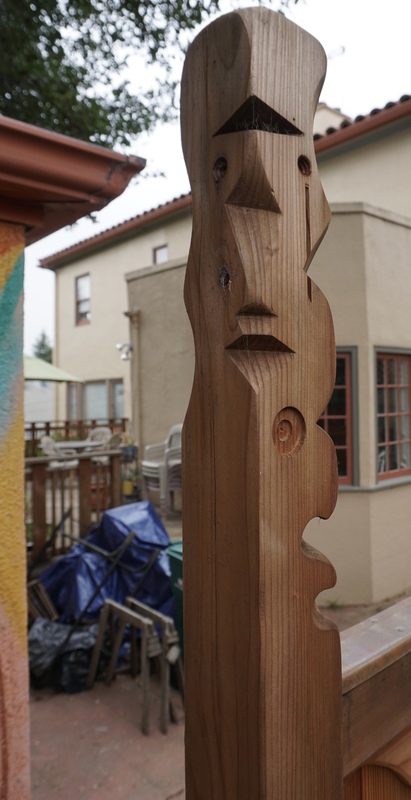 Thanks to the Oakland Museum of California’s inspiration, I have art running all over my backyard! I hardly have to venture out into Oakland these days. Plus there are artists in my neighborhood of all kinds—musicians, dancers, painters, potters, mosaic artists, muralists, and fine woodworkers. Amazing and such talent! Thank you for sharing. Great piece, Emily! Wonderful pics of the yard; will share this with Ramsey! 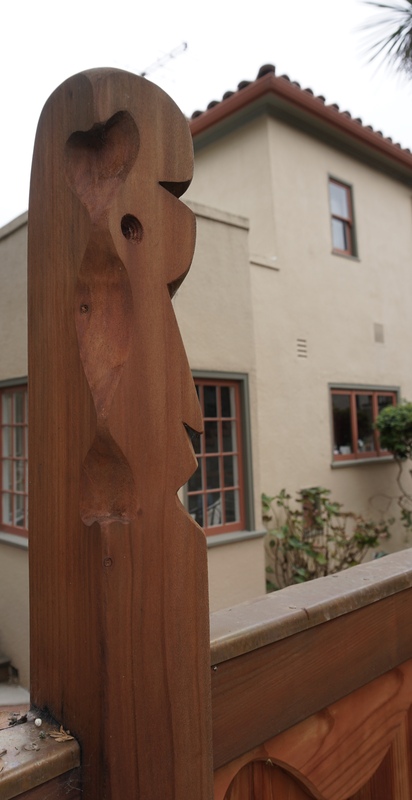 Love the way you bring art into your backyard & your daily life. This is so you Emily! Wow Em – what a great transformation! That is just amazing. Elise would love to see this too. 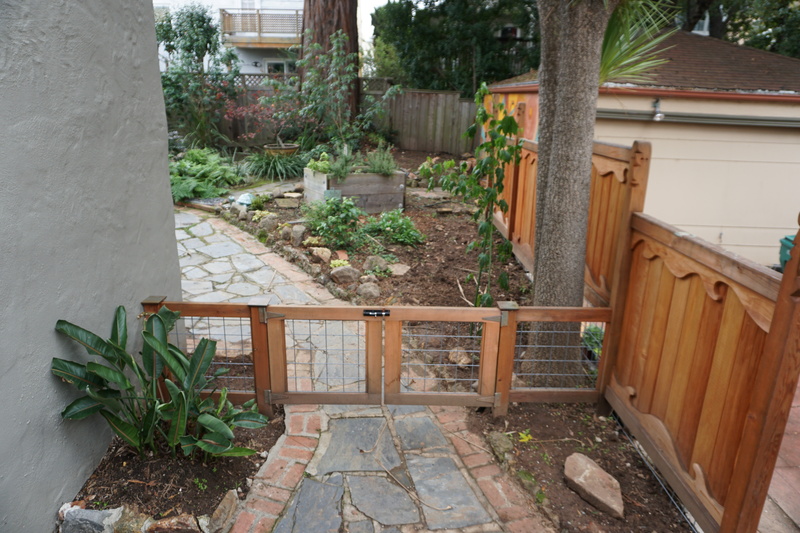 HI Emily –AWonderful transformation of your back yard. I recently took a tour of the murals on the second floor at Coit Tower–only recently re-opened to the public. Make sure you visit. Follow this blog and receive email notifications of new posts.